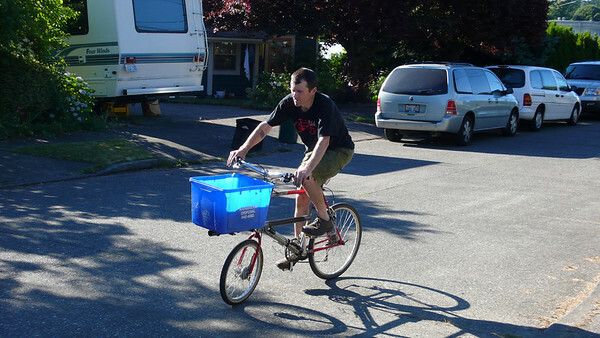 Archive for the ‘cargo bike’ Category. A little backstory. If you don’t care then skip to the end. I got a lot of help on this project from Val Kleitz and the other people who worked at “The Bikesmith”, a fantastic shop that used to be in Wallingford. This was the first bike that I builtup with their help, but it wouldn’t be the last. During the 6 or 7 years that I shopped there Val spent countless hours chatting with me, letting me hang out and absorb shop talk, and helping me learn about bikes. 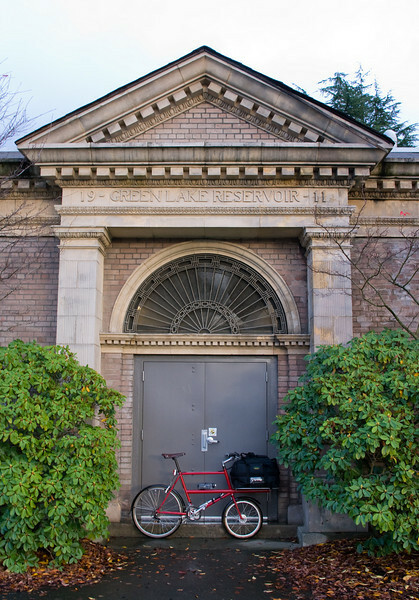 I know that Val has touched a lot of the Seattle bicycle community in the same way. Hahn Rossman, who also worked at that shop, is the guy who told me about the Internet-BOB mailing list, which I now host. I kind of knew about it already and protested that I didn’t own a Bridgestone bicycle (after all the list is called the Bridgestone Owner’s Bunch). He said that didn’t matter and I should join anyway. He was right. A few weeks ago I learned that Val has cancer. Last Tuesday night there was a party and fundraising raffle to help Val with his cancer. I bought a lot of the tickets sold that night, but the amount that I spent was barely a drop compared to the flood of learning that I’ve had from Val. It is also probably a tiny drop of what Val needs to get past this illness, but I hope that it is a little bit of help. I think I bought less than half of the tickets, but I won most of theitems. I gave almost all of them back and asked for them to be reraffled. One item in particular (a pink Brooks Swift saddle) really wanted to go home with me and I won it twice in a row,but on the third time it figured out that it really should go live with someone else. I did win and keep the big prize of the evening,a Surly Big Dummy frame and fork. This is the backbone of a serious cargo hauler. 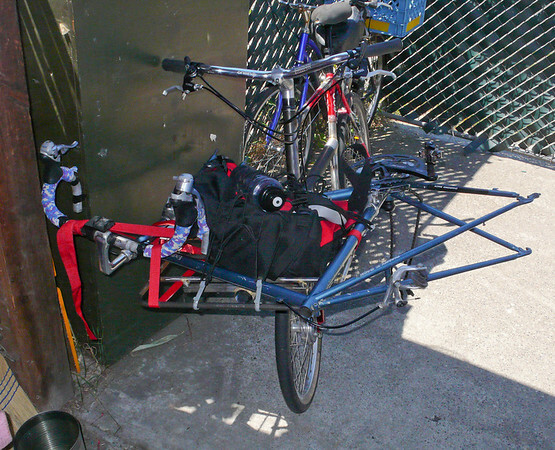 I’d keep it, but I like building my own cargo haulers and don’t have the room for one this large (it is about the same size as my tandem…we use the tandem a lot, so the Surly won’t fit). I brew beer and those are homebrew kegs that he is carrying. 5 gallons each is 40lbs of beer, plus about 15lbs for the keg. That is a roughly 220lb load. My cargo haulers can’t do that. I’m selling the Big Dummy for $650. $600 of that is going to Val to help his fight with cancer. $50 of that is going to Kent Peterson who keeps all of us amused (including Val) with great stories from the trail. The frame normally retails for $1050, but they are on sale right now and many places are selling them for $700. The cheapest price online that I can find is $609. I think my price is fair, and the money is going to a good cause. I promissed Val that I’d find a buyer who would use the Big Dummy and I hope to be able to live up to that promise. I’d strongly prefer to sell this to someone in Seattle. I’ll even deliver it to anyone within 50 miles of Seattle. I know it can be shipped, but it is expensive to do so (about $100-150) due to the size of the box. If you are interested please email me. alex at phred dot org. Some Projects Wrap Up, Others Begin…. I rode about 60 miles on the Cycle Truck during the last week. 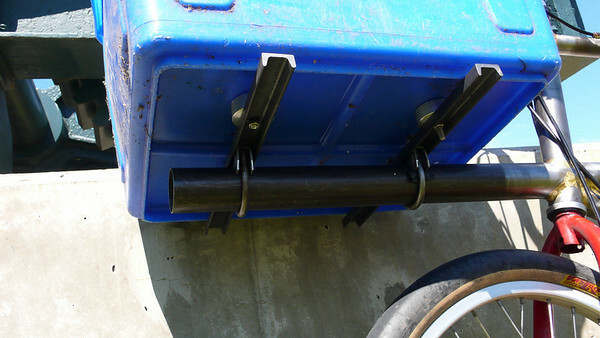 During the week I was just riding it as a naked bike, but yesterday I fashioned together a basic container using a recycle bin and some muffler clamps. 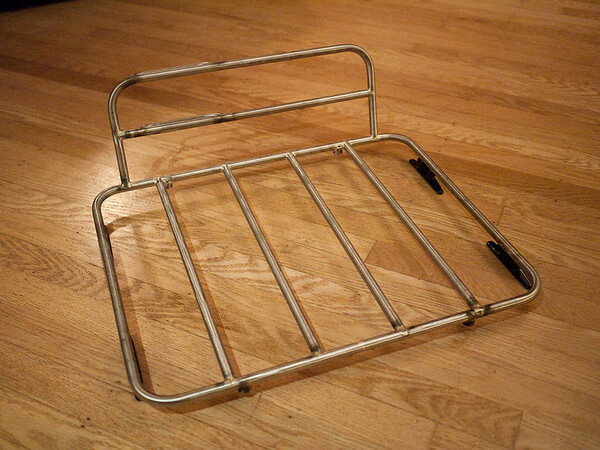 It’ll do until I have a chance to build a real front rack (right now I’m waiting on metal, tools, and my bag!). I really enjoyed those 60 miles. It’s really exciting to ride something that I built and have it work. This brazing stuff is addicting. The Cycle Truck handles well but my temporary cargo box is pretty mediocre and has a lot of flex in it. There is more to do too (building the rack, a lot of finishing work, re-routing the shift cables along the top tube, installing fenders). I still hauled a decent amount of stuff in it this weekend and the bike is already proving it’s worth. I’ll probably keep quiet on the Cycle Truck until the new rack is done. The deck is complete. We used these neat hidden fasteners called EB-TY so it just looks like one great expanse of wood. It is sectional so we can partially disassemble it should we need to do any roof repairs. 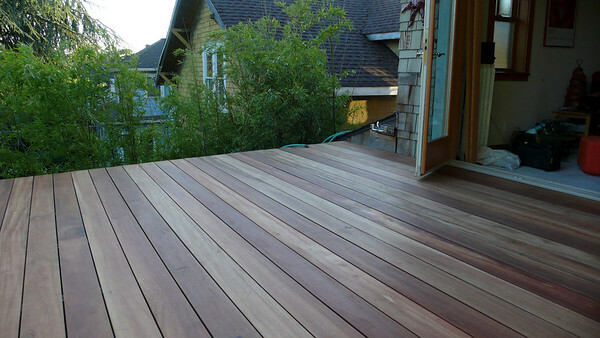 We still need to put a railing up, but it is really nice to see the deck finished. I think the tigerwood looks pretty cool too. I promised some new projects too. 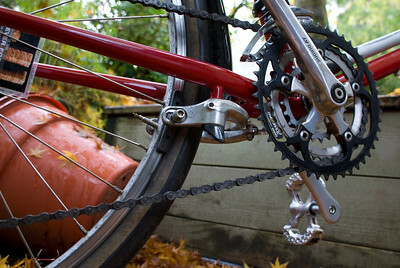 Today I rode out to Aaron’s Bicycle Repair and picked up a SRAM i-Motion 9 hub. This is going on a Bike Friday Tikit. 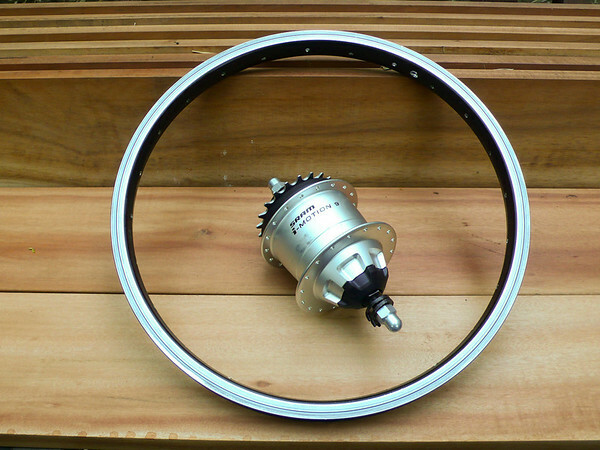 I know, I already converted a Bike Friday Tikit to have an internal hub gear (and now even Bike Friday is doing it). I have something up my sleeve for this conversion that’ll make it more interesting. The hub came from Aaron’s Bicycle Repair (what other shop in the US stocks all of this internal hub gear stuff) and came home on the Cycle Truck. The other project is a mountain bike. I sold my mountain bike at the swap a few years ago and haven’t missed it. My cyclocross-ish IvyCycles and RB-T do nicely off road almost all the time. However we’re spending a week surrounded by mountain bike trails late this summer and I thought it would be nice to have a real mountain bike available. 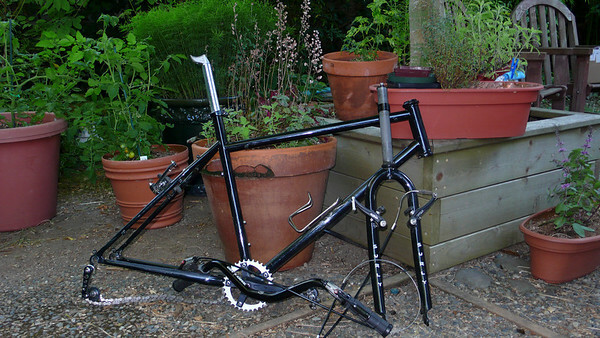 If I don’t ride it much compared to the IvyCycles then it’ll be on the chopping block. If I find that 60mm tires really do make a difference compared to 40mm ones then it might stick around. I bought the bike as a single speed but will be putting a Rohloff rear wheel (which is going on yet another future project) on it for now. 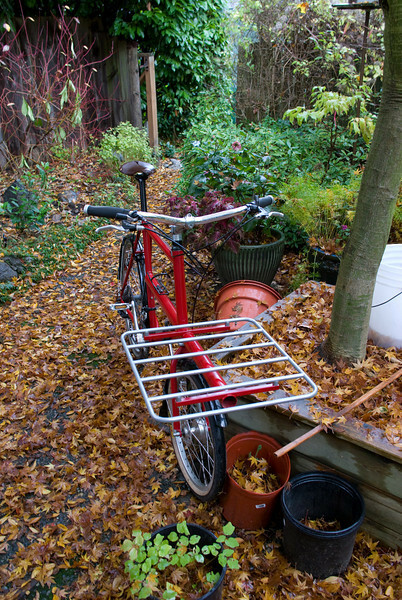 Next steps — Build it up(they knobby rear tire isn’t staying) and ride it, then build a rack for it. Alistair helped me with alignment today and took a few photos too. The framebrazing is done except for a couple of water bottle bosses and whatever other brazeons I realize that I forgot. We measured the angles today, around 71.5 seat tube angle and 73.5 for head tube angle. Fork offset is around 30-35mm (this is a fork from a Bike Friday Family Tandem) giving a trail of about 35-40mm and flop of about 10-11mm. Right in the ballpark. I have nothing finished to show, but I have progress on the deck, cargo bike, and my bicycle jig. The deck is half done. We were hoping to finish it this weekend but the 90F weather kept us off of the roof. We’re also waiting on 5 more boards to be delivered. 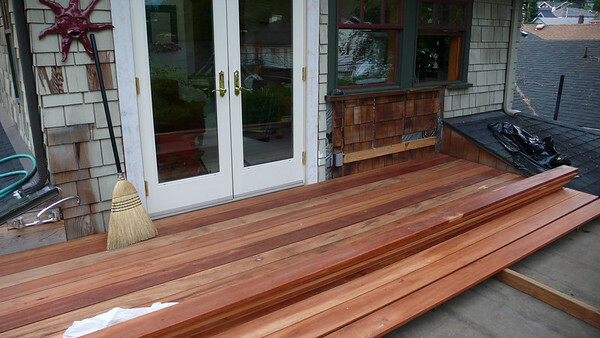 The new decking is Tigerwood (from Ecohaus) and I really like how it looks so far. We’re using hidden fasteners called EB-TY. It took us a little while to figure out the best way to build the deck (especially because we are doing it in sections so that it can be disassembled), but now it is going pretty fast. Hopefully we can finish it up next weekend. I’m embarrassed to show these photos of the cargo bike and fixture in progress because they show how much of a slob I can be about my workspace. The basement is a disaster, but I never feel like stopping work to tidy up. The CAD drawing has been updated. There are a few changes and I switched the drawing to much easier to work with software (TurboCAD, I was using QCad). 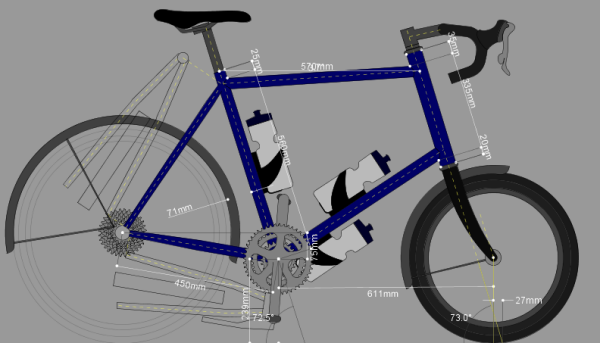 Real progress on the cargo bike is occuring on two fronts. The first is building tooling that will be used on any frames that I built. I have most of the front triangle fixture completed. 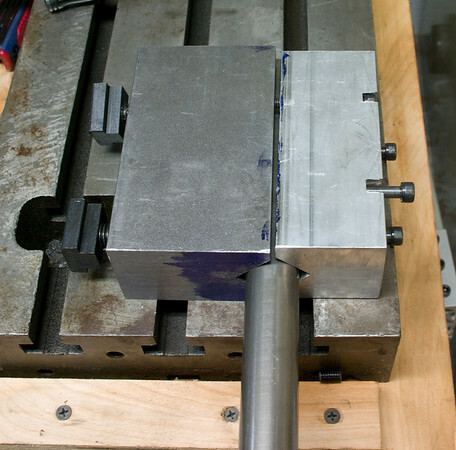 I’m building my fixture around a milling table that is 9 inches by 36 inches with 3 T-Slots running the length of the table. 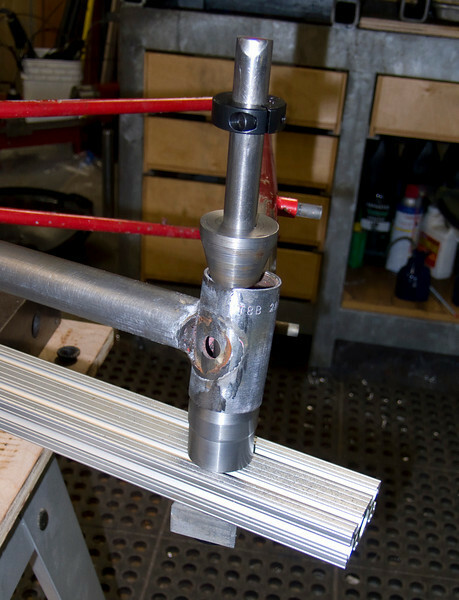 This table is accurately machined flat (not as perfectly as a surface plate, but well enough for bicycle frames) so I can also use it as an alignment table.Everything will be modular so that I can use the same base for building forks, rear triangles and other things. 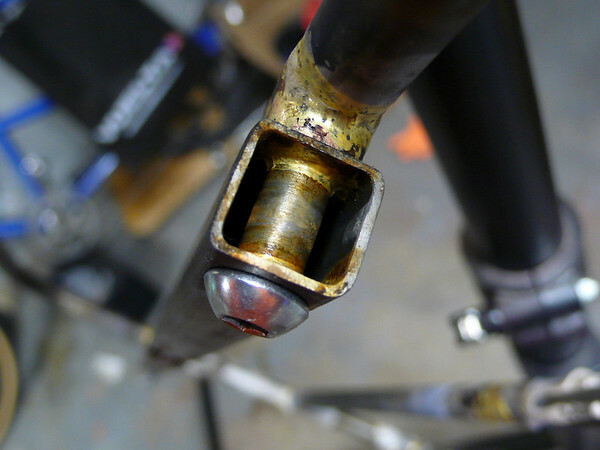 The bars under the seat tube and head tube are made from pieces of 80/20. They have T-slots in them too and are connected to the table using some brackets that I made. 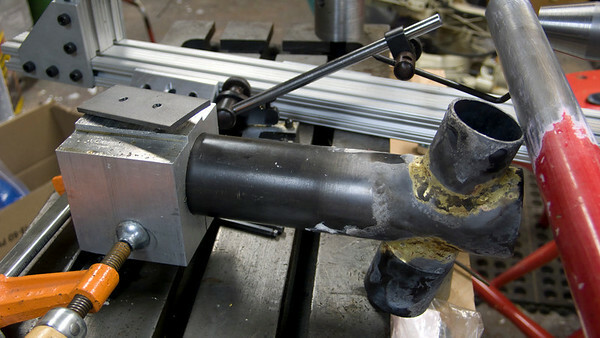 The brackets connect to the 80/20 usingT-Nuts that 80/20 sells and to the T-Nuts for the milling table. 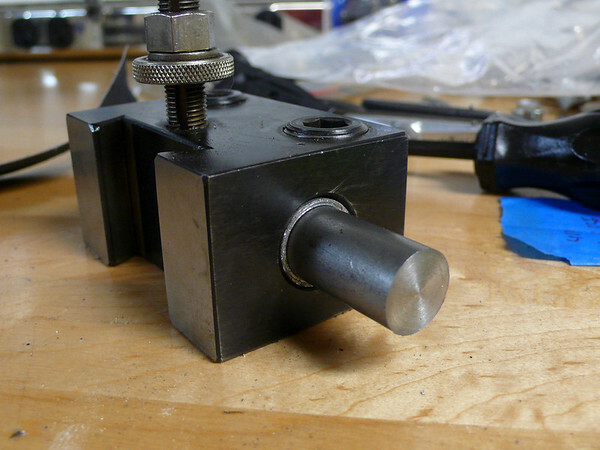 The milling table T-Nuts are setup for 1/2-30 bolts that are huge, but I bought some reducing bushings from McMaster-Carr that let me use smaller bolts. 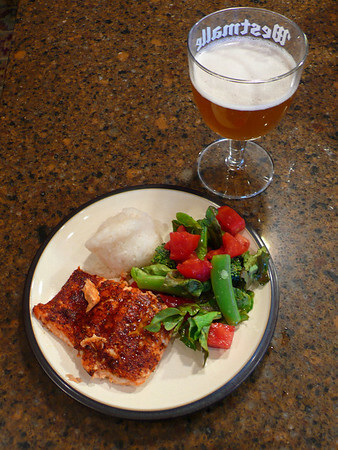 I can adjust them to any angle (using a protractor to check the angle) and then lock them into plate. The tubing is held in these towers which are also primarily 80/20 with tube holding cones that I made on the lathe. I got the idea for these towers from a bicycle jig on Instructables, but changed the setup to be height adjustable. I shouldn’t need to adjust it once the whole thing is dialed in. 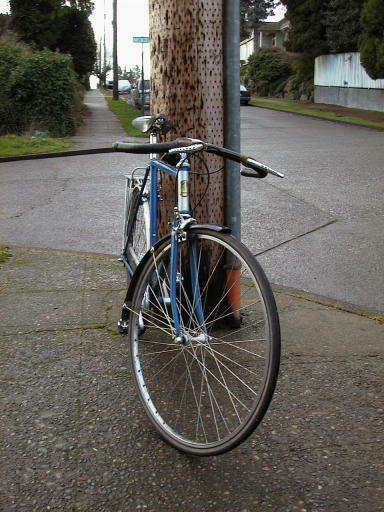 The bottom bracket is held in place with a vertical post and cones which sit on it. This is sort of an exploded view, with the top cone loosened. Everything is clamped in place with two clamping collars. 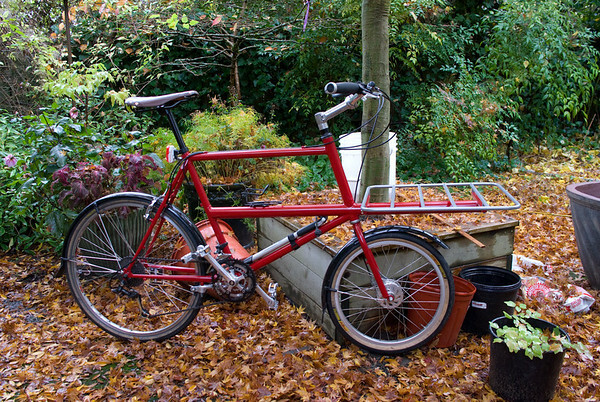 The other progress is on the cargo bike itself. 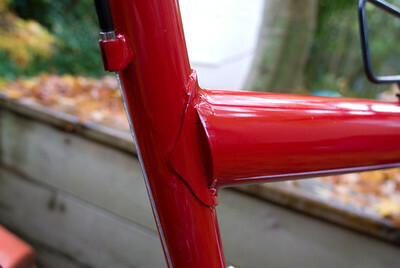 As you can see in the first photo the donor frame has had it’s paint stripped (where I need to braze to it) and the headtube and downtube have been cut off. 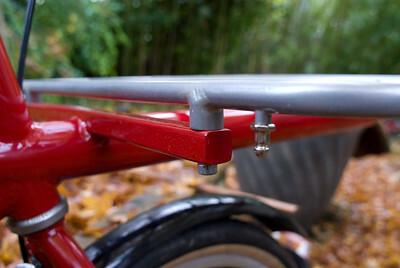 The cargo tube on the cargo bike has some really tricky mitering. I built a fixture to do this miter (and others) on the lathe. 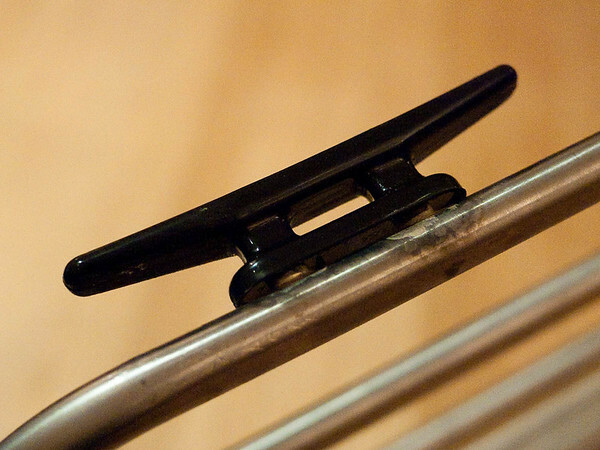 This is what the mitering fixture looks like: (I’ll take some photos of it in use next time I’m using it). 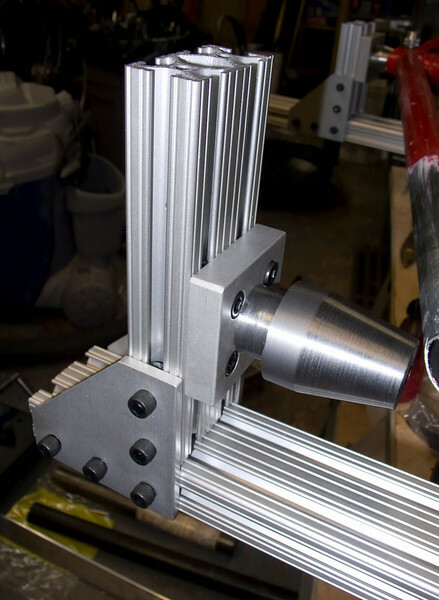 It mounts to a T-Slot in the lathe’s compound slide. I can set the angle to on the compound slide to my miter angle and then use a hole saw to make the cuts. That block was made on the lathe and boring a 1.75″ hole took a long time. I’ll be able to use it for other tubing sizes with some reducing bushings that I need tomake. The mitering fixture works really well,but I need to tweak it a bit to get it better centered. Right now the miters are about 1mm off of center. In that photo you can also see one of my test joints (I’ve made three of these and cut the other two apart). I’m pretty happy with the brass penetration that I’m getting,but the brazing looks a little sloppy and will require cleanup work. I’m getting better with practice, these big joints are a lot different than the little ones that I make for racks. 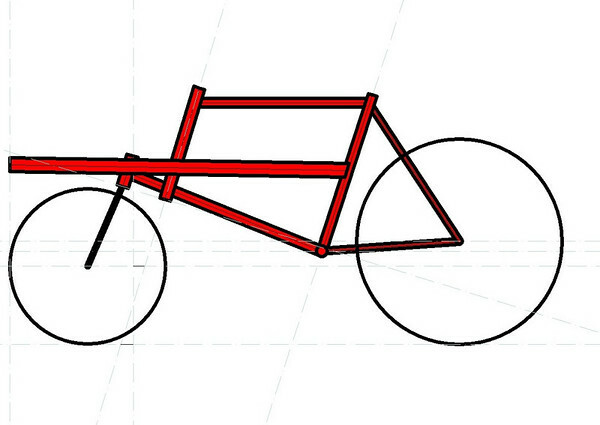 A year or two ago I drew up this design for a 20″ front, 26″ rear wheeled cargo bike and posted about it on this blog. 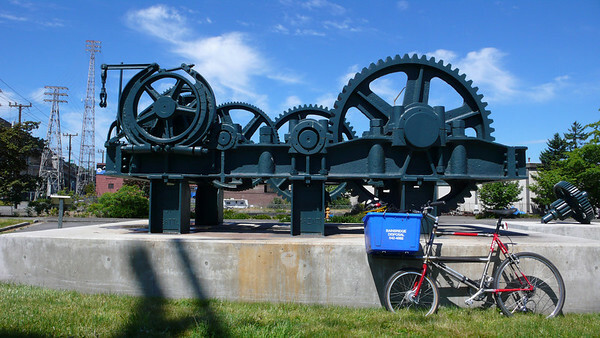 This basic design is often called a cycletruck after the classic Schwinn sold around WW2. 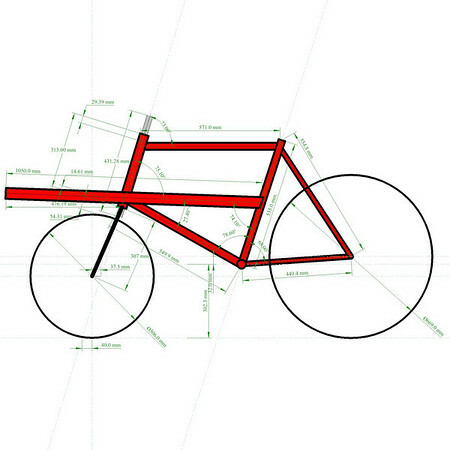 The idea is that a smaller front wheel leaves more space for a big rack over the front wheel. The nice thing about this design is that the wheelbase is normal (so I can easily store the bike), but it has a pretty large hauling capacity. 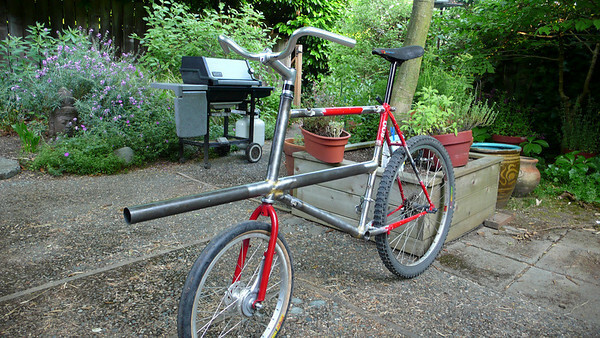 James Black extended this design in his cycle truck (built by David Wilson) by using a large boom over the front wheel to support the rack and 20″ wheels front and rear to allow for a low rear rack too. 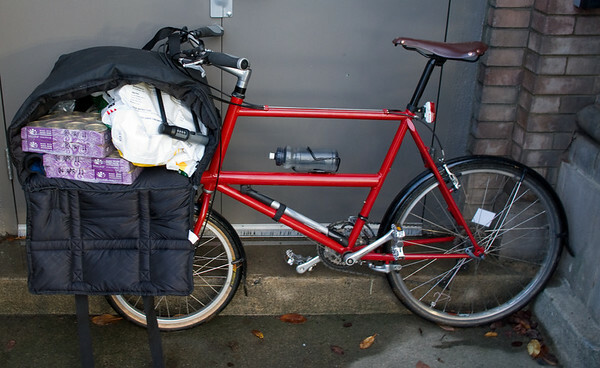 His cycle truck is probably the best of the compact cargo bike designs that I’ve studied or ridden. 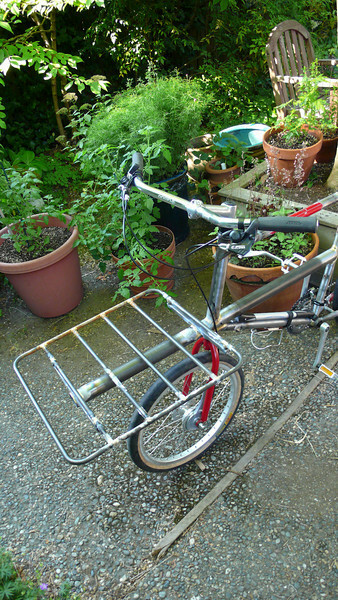 One of my planned brazing projects has been to build a cycletruck of my own. 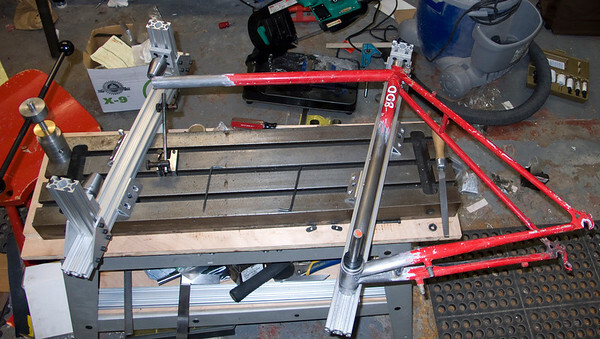 I wanted to keep it simple, so I’m starting with a donor MTB frame. 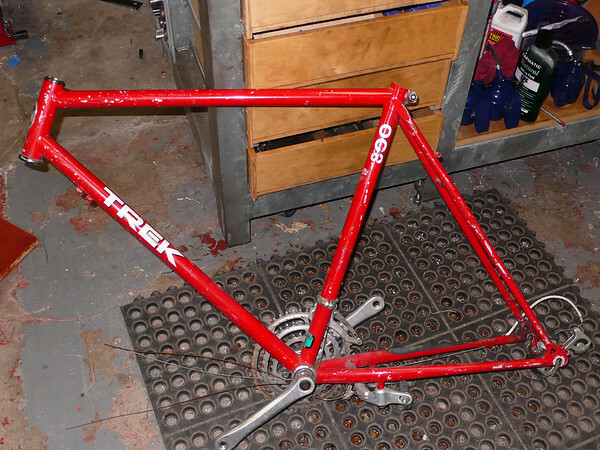 Yesterday I was going by Recycled Cycles and found the perfect frame on their free rack — a ~1990 Trek 800 in my size. To most people this is pretty junky, but for this project it’s exactly what I needed. The tubing is unbutted, so I can cut off the head tube and braze on a new one without worrying about where the tubing gets thin. It looks like it has already lived a good life, so I don’t feel bad chopping it up. 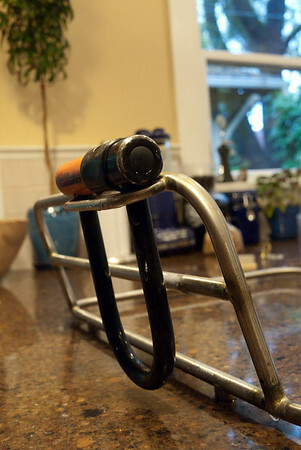 I also have an old Bike Friday 20″ fork that will work nicely for the front wheel. 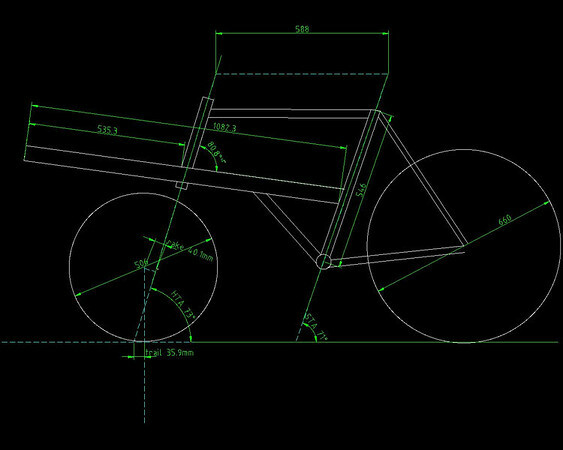 The plan is to braze on a new head tube which is longer and steeper (73 degrees vs the 71 degree HTA on the bike today). 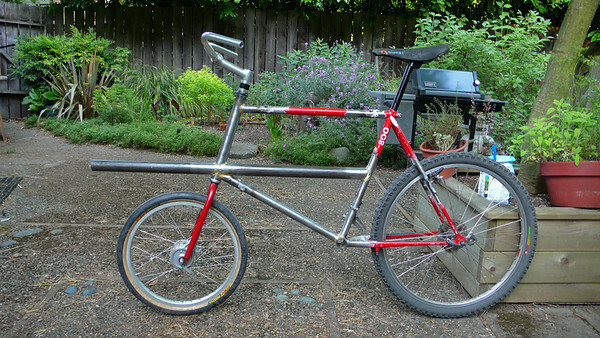 Then I’ll run a 1 3/4″ x 0.058″ tube from the seat tube, around the head tube, and sticking out over the front of the bike. 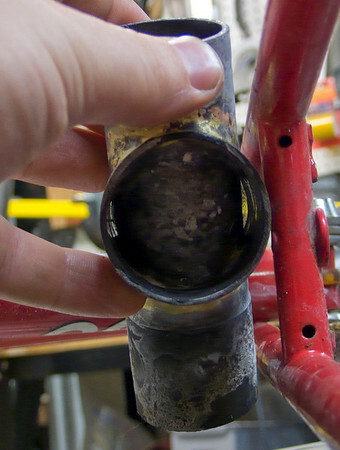 The original downtube will miter into this (or I’ll make a new downtube that goes from the BB to the base of the head tube). 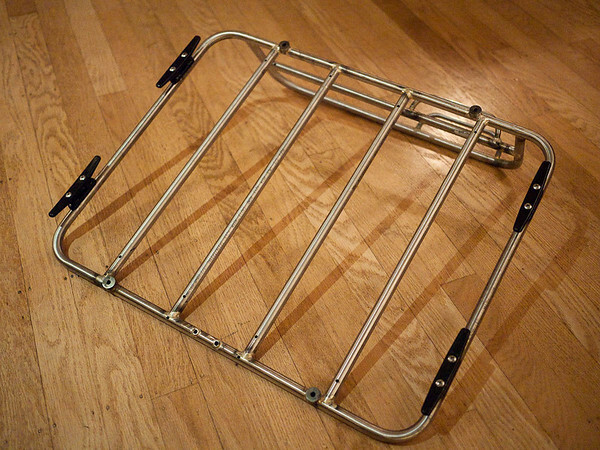 A roughly 18″ by 20″ rack made of 1/2″ tubing will sit over the front wheel. It’ll be challenging for me, I haven’t done anything on this scale before. 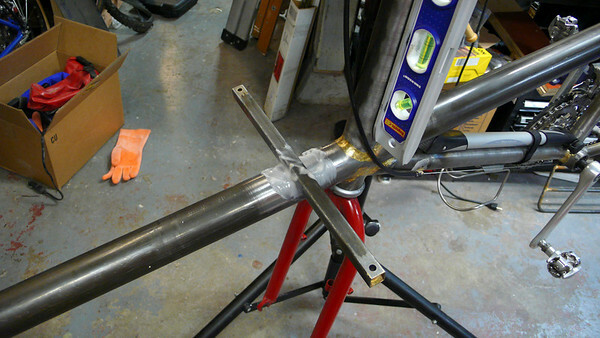 A few of the tricky bits are going to be making a nice through hole in that 1 3/4″ tube for the head tube and fixturing it to keep the frame well aligned during the brazing process. I’ll need to build tooling for some of that and plan on documenting my progress as I go. I have an aggressive goal of having this finished by the July 4th Cargo Bike Ride, but if I miss that target I won’t be surprised or feel too bad.